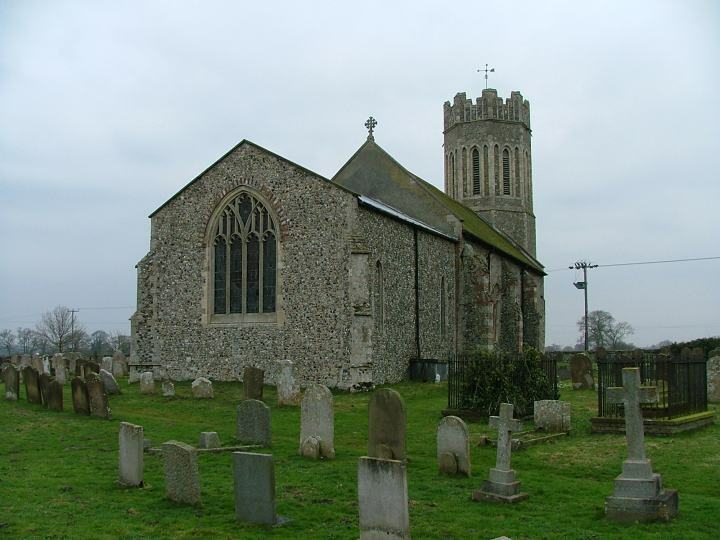 In this area of humble round-towered churches, St Margaret is rather grander than the rest. This is partly explained by the glorious 15th century crowning of the 13th century octagonal tower. The round windows are like those of the same period at Haddiscoe, but the tower is round internally, and there are Norman windows into it in the west wall of the nave, and so I think Pevsner is right to suggest that it is, in fact, a thirteenth century encasing of an older round tower. While looking at the tower, you will also notice the 19th century churchwardens' names inscribed in the lead of the porch. Inside the porch are some stunning corbel heads. They are in wood, and the wood has aged, and contorted the heads. They are wonderful - amazing that Pevsner didn't spot them. Perhaps he was overcome with being right about the tower. This is a big church inside, and full of light. The roof puzzled me. It appears to be ancient - notice the way that the wall posts overlap the 15th century windows, as if the wall had been cut away behind them. And yet, it overlaps what was probably a sanctus bell window in the east face of the tower. There are two sets of Royal Arms, one Charles II and the other George II, facing each other across the south and north doorways. The east window 20th century glass of Christ in Majesty by Thomas Derrick is superb, with medallions of the evangelistic symbols arranged below it. The memorial to the north of it is a composite, made up of bits of one or more 17th century memorials. Pevsner may be right about the tower, but he gets it wrong when he says the object at the bottom is an open book. It is obviously a double-sided prayer desk, and it suggests that there were once small figures arranged weeping either side of it. Thus lend all my cost, this I had this I lost. Across the chancel, John Kedgell was a good benefactor to the poore. I admire this church greatly, because, despite suffering a number of heartbreaking robberies over the last few years, all of which are cheerfully detailed on a notice in the porch, they are determined to keep the building open for passing pilgrims and strangers. Amen to that.